Tomorrow evening I'm taking part in the NSPCC's Really Big Board Game Day to help raise money for charity to rebuild the lives of vulnerable children through play therapy. The idea for the fundraising event is that you get together with friends, play some board games and donate money to the charity. What I learnt when I recently read the book A Storm of Witchcraft is that there is a actually a connection between board games and witches. Parker Brothers, the company famous for producing Monopoly, was founded in the Witch City of Salem in 1883. One of its first games was called Ye Witchcraft Game, released in 1888. It isn't something I've played and I suspect it is rare as I can't find much out about it with a web search. In 1960 Parker bought the rights to produce Ouija boards, which went on to be a best seller and you can still buy sets today. The fact that Ouija boards are sold as games is considered controversial by many, and debates continue about whether letting kids dabble in necromancy is a good idea. I've already blogged about my own thoughts on the subject. Parker brought out yet another witch-themed game in 1970. It was called Witch Pitch and the idea was to throw hoops onto a haunted house. Apparently it never sold that well. 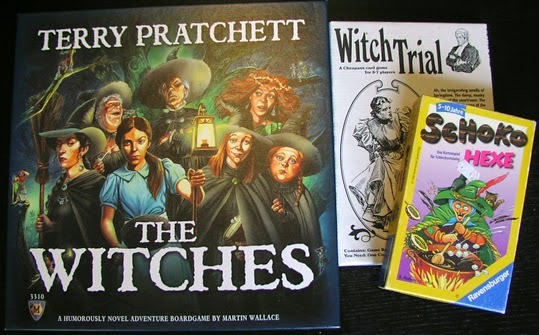 My favourite game about witches is Terry Pratchett The Witches Boardgame. Each player takes on the role of a trainee witch in the land of Lancre under the watchful eye of Granny Weatherwax. You travel around curing sick people and farm animals, helping deliver babies, consoling bereaved relatives and competing to be the best witch in the valley. I was given the game for Yule two years ago and I hope to play it again this Friday. I've also got a card game called Schoko Hexe, which I understand translates as Chocolate Witches. The idea is that witches make the best chocolate, but are trying to keep their recipe secret. Players collect cards to try to get all the things they need to make chocolate, but if a witch turns up she steals your ingredients. It sounds simple and is intended for kids, but all the adults I've played this game with find it great fun too. Witch Trial by Cheapass is another card game, but even though I bought a copy a few years ago I've not yet played it. Players represent lawyers in a Salem-type courtroom and try to make the most money through prosecuting or defending those accused of witchcraft. It is meant to be humorous, but my suspicion that the humour could be a bit poor taste is probably the reason it has remained unplayed by me. I suspect it will stay in the box tomorrow evening too, but then again I don't think I'll be getting out the Ouija board either. But Schoko Hexen and Terry Pratchett the Witches will hopefully get played.